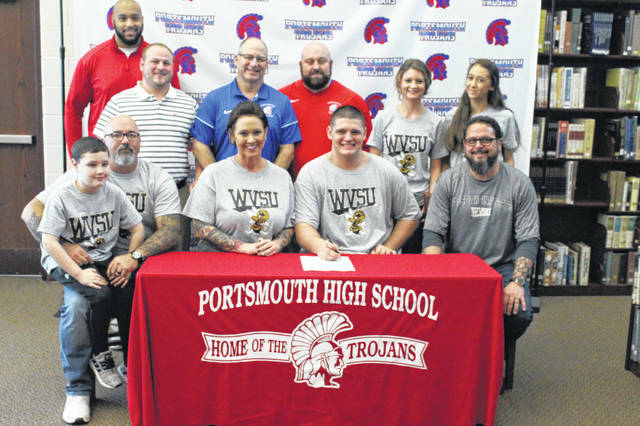 Portsmouth senior Colin Boehm signed his letter of intent to play football at West Virginia State University at his signing ceremony Wednesday afternoon. PORTSMOUTH – Dozens of students gathered together Wednesday afternoon in the library at Portsmouth High School to see senior Colin Boehm sign his letter of intent to attend and play collegiate football at West Virginia State University in Charleston, West Virginia. Boehm becomes the first player under head coach Bruce Kalb to sign to play collegiate football following his graduation in May. Boehm was one of the key components of the Trojans offensive line during his high school career, as Kalb mentioned, including helping bolster the line to historic rushing numbers during his senior season as the Trojans earned their first playoff berth since 2007 last fall. Aside from the numbers Boehm was able to help produce from tackle position, Kalb knows that his leadership, on and off the field, will be one of the hardest things to replace when his senior moves on to play at the collegiate level. The thing that peaked Boehm’s interest the most about attending West Virginia State? The feeling of home and family atmosphere playing for the Yellow Jackets presented. Boehm said he plans on majoring in education upon enrolling at West Virginia State this fall. As he moves into the next chapter of his life, Boehm knows that no matter what, he wouldn’t have been able to make it to this stage of his life without his friends and family there to support him.